In a large mixing bowl, combine the flour, salt, and pepper. 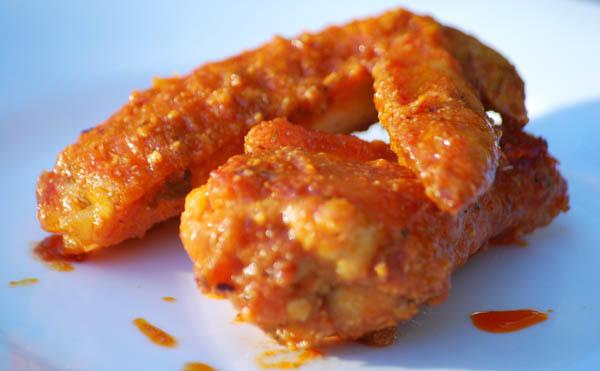 Place chicken wings in the bowl and toss in the flour until the wings are well coated. Place the wings on two large baking sheets and bake in the oven until crisp and well done, about 1 hour and 15 minutes. About 20 minutes before the wings are finished cooking, prepare the sauce. In a medium sauce pan, melt the butter then add the hot sauce and mix well. Add remaining ingredients and heat to a low boil and bring to a low boil, stirring frequently. Simmer for 10 more minutes then remove from heat. When wings are done (MAKE SURE THEY'RE CRISPY), remove from oven and transfer to a large bowl. Pour the sauce over the wings and mix well. Serve with celery and carrot sticks and a side of blue cheese dressing. Wow, they look really, really good. I like the shadows in the picture. once you take the wings out of the oven, let them sit on the baking sheet for 5 minutes, before putting them in the bowl, and covering with sauce. In this 5 minutes, the wings will crisp up a bit, and also be easier to remove from the pan (with metal spatula). This was a great recipe. I love wings but not frying. I made this today and my fiance loved them. Will be a football staple for us for sure!